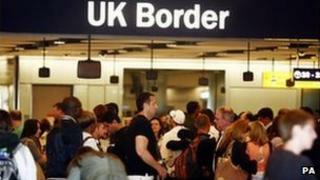 Net migration levels to the UK have fallen significantly in the past year, official estimates have indicated. Net migration - the balance between the number of people who come to live in the UK for the long-term and the number who are leaving - fell from 242,000 to 183,000 in the year to March. The reduction was principally because of a fall in the number of foreign nationals studying in the UK. The government wants to reduce the annual figure to the tens of thousands. The Conservatives made reducing net migration a key part of their immigration policy while in opposition. Provisional data released by the Office for National Statistics on Thursday indicates that net migration in 2011-2 fell to below 200,000 for the first time since 2008-9. Over that period, inward migration to the UK fell by 42,000 to 536,000 - with the number of non-EU nationals settling in the UK falling from 317,000 to 296,000. The ONS said the fall was "largely due" to a drop in the number of foreign students despite an increase in the number of arrivals from China - the UK's largest overseas student market. At the same time, the number of people choosing to leave the UK rose from 108,000 to 127,000. Home Office minister Mark Harper said the latest figures showed the government was bringing immigration "back under control". "Our tough policies are taking effect and this marks a significant step towards bringing net migration down from the hundreds of thousands to the tens of thousands by the end of this Parliament," he said. Migration Watch, which campaigns for tighter controls on immigration, welcomed the figures. "We can now see the first effects of the government's measures to reduce immigration," its chairman Sir Andrew Green said. "There is a distance to go but they are on the right track." The BBC's home affairs correspondent Danny Shaw said despite the lowest inward migration since 2004, the figures suggest the government still has some way to go to meet its goal to reduce net migration to below 100,000 by 2015. The net migration target has caused some tension within the coalition, with Lib Dems and some Tories - including Mayor of London Boris Johnson - believing it risks send the wrong signals to foreign students and hampering the economic recovery. And there are warnings that any fall in net migration driven by lower student numbers could come at a "significant economic cost". "Steps to reduce abuse of the student visa system are welcome but if the government's net migration target is to be met, they also need there to be a dramatic fall in the numbers of genuine students," said Sarah Mulley from the Institute of Public Policy Research. She said the 26% fall in the number of student visas issued could ultimately prove counter-productive. The figures come on the same day the Chief Inspector of Borders John Vine warned that thousands of overseas students may have been allowed to stay in Britain illegally because UK Border Agency staff failed to check out tip-offs about them - a backlog of 153,000 had built up at one point, he said.